This paper (which relates to the fifth paper from the Challenge Program for Water and Food ‘Research for Development’ series) is the first in a series of three interrelated papers and focuses on planning and implementation modalities of Rainwater Management (RWM) Strategies. It is part of the NBDC project ‘On integrated RWM strategies—technologies, institutions and policies’.The project is underpinned by the recognition that integrated RWM needs to combine technologies, policies and institutions and be developed through multi-stakeholder engagement to foster innovation. Three woredas were selected for the research—Jeldu and Diga in Oromia Region and Fogera in Amhara Region. The research on planning and implementation of RWM strategies is guided by the hypothesis that there is a gap between available policy and guidelines and specific planning and implementation procedures. Research findings conclude that RWM planning and implementation is still rather top–down and technology-oriented instead of people-centred. Local processes are not in place to take account of different livelihood strategies and constraints, cultural, social or institutional dynamics as well as power relations and gender issues. The research concludes with six recommendations, largely aimed at Ethiopian policymakers and implementing agencies, suggesting an alternative approach to RWM planning and implementation processes which would help improve the impact, sustainability and local ownership of interventions. 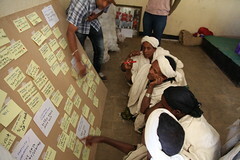 The paper outlines RWM strategies which are developed with true participation of farmers and other stakeholders; are based on evidence of what works and why; take into account specific socioeconomic and ecological niches; work across relevant sectors; and support local opportunities for innovation.